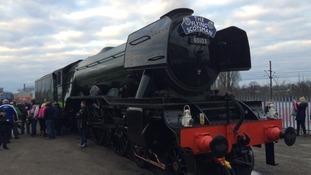 The Flying Scotsman will travel on the Settle to Carlisle line to mark the reopening of the railway. The track was shut for repairs for over a year as engineers worked to shore up the 500,000 tonne landslip, which threatened the line's future. The world's most famous steam engine spent another day making history, as it helped mark the official re-opening of one of the region's most famous railway lines. Thousands turned out along the Settle to Carlisle line to catch a glimpse of the Flying Scotsman - built in Doncaster and recently restored to its full former glory. Calendar weather presenter Jon Mitchell was one of the lucky few to spend the day on board. A number of enthusiasts gather to watch the moment the Flying Scotsman crosses the Ribblehead Viaduct as part of celebrations to mark the re-opening of the Settle to Carlisle railway line. The world's best-known steam train, the Flying Scotsman, is celebrating the re-opening of the Settle to Carlisle railway line today. The Doncaster-built steam engine will depart from Oxenhope this morning and travel via Haworth, Keighley and Skipton to Carlisle.